Tiger Woods plays his shot from the 5th tee during the final round of the 2018 PGA Championship. 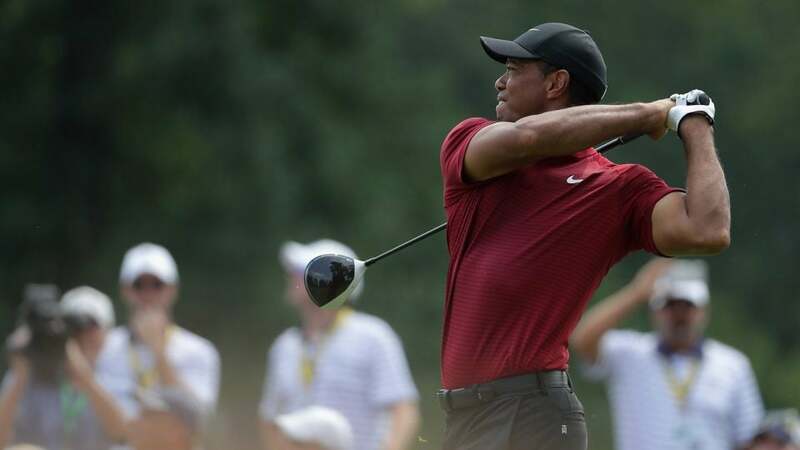 As Tiger Woods prepared to hit his tee shot on the 5th hole on Sunday at the PGA Championship, the crowd hushed as he took a few practice swings. He was already two under on the day and in the early stages of mounting a charge on leader Brooks Koepka. The ensuing shot wasn't pretty, though, as Woods blew his drive into the right rough. A video filmed by a spectator and posted on Reddit revealed that just before Woods drew back his club, the tinny sounds of a cellphone ringtone reverberated through the air, cutting into the silence and upsetting the gallery gathered around the tee box — and presumably Woods, too. "I thought I might see a riot," wrote the fan, who posted the video to Reddit under the username carpedonnelly. Woods has long battled the hustle and bustle (and cell phones) and of the huge galleries he draws — at the British Open in July a fan yelled out as Woods hit his tee shot on the 72nd hole — but he has not become immune to them. “All it takes is one shot on a Thursday that you lose a tournament by a shot on Sunday,” Woods said earlier this year. “What people don’t realize, it’s not just something that happens on Sunday afternoon, this is cumulative and it’s par for the course. I’ve dealt with it for a very long time.” Woods saved par from the rough on the 5th hole at Bellerive. He went on to finish in solo second place, two shots behind Koepka.